Yesterday, here in the UK, was the May Day Bank Holiday and most unusually for a Bank Holiday, the sun shone and it was beautiful. My brother came for the day with his baby daughter. His wife is a busy hospital doctor and was working and my children were with their friends, so he and I had a wander through Skipton, which was busy and bustling with locals and tourists alike. 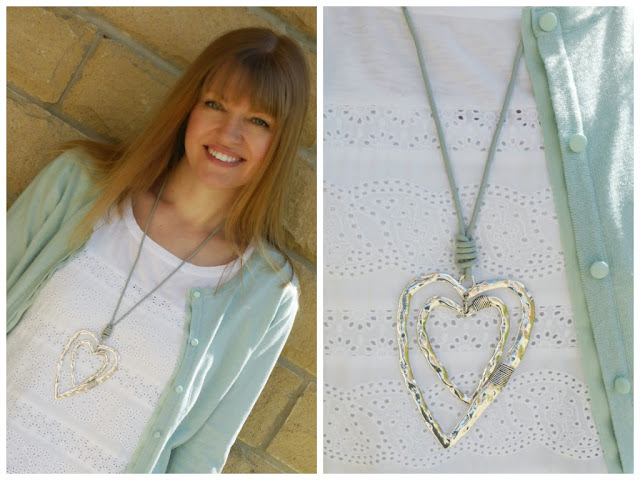 This heart pendant (from my boutique) adds interest to this simple outfit. It works with so many outfits and the grey leather cord compliments the pale aqua of my cardigan beautifully. and a double grey leather Pandora along with a silver one. We went to Forage, a gorgeous cafe-deli in Skipton which I hadn’t visited before. My brother had Piccolo Latte, served in a shot glass. He is somewhat of a coffee expert and said this was the smoothest he’d tasted in a long while. And I had cappuccino which was also excellent. The menus are within the pages of little wildflower anthologies, such a beautiful and unusual touch. We sat outside in the sunshine and spent a happy half hour chatting whilst my niece slept in her pram. After which we headed home for a buffet lunch. Previous Post Outfit: Little Navy Dress, Leopard Shoes and Striped Trench. 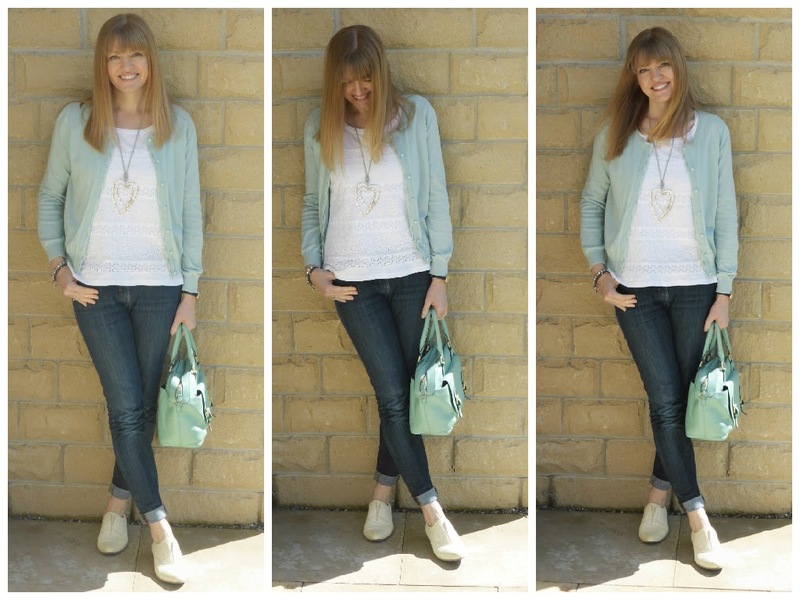 Next Post Home: A Few Little Words- Inspirational Postcards.